After graduating from a Disciples of Christ college and a United Methodist Seminary, I was ordained in the Assemblies of God. This ecumenical background has opened many doors as I speak across a number of Christian traditions. While in seminary, I served in Youth Ministry, Young Adult Ministry, and Worship Ministry in congregations in Wisconsin and Illinois. 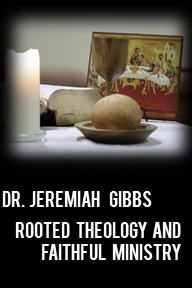 I have written on Pentecostalism, liturgy, prayer, and apologetics in academic and professional journals. I recently completed and defended my dissertation on the implications of postliberal theological method for the discipline of apologetics. But I have been leading retreats for high school and college students for several years on vocational discernment and the theology of calling. I plan to write my first book on this topic. I am married to the Rev. Jenifer Stuelpe Gibbs, who is Associate Pastor of Meridian Street United Methodist Church in Indianapolis. We adopted our son, De’Avalon, when he was four years old. I learn as much about faithful discipleship from the two of them as I have from studying theology. Your dissertation sounds like it will be interesting – the postliberals at Duke didn’t often seem very friendly to the usual modes of apologetics. I take it you’ve read Placher’s “Unapologetic Theology”? Look forward to hearing more about it! I just found your blog post “The Day That I Started To Understand Racism.” Thank you, sir, for those well-written musings on race in this country. Thank you, too, for being a glowing example to organized-religion skeptics like myself. We see so many negative example of so-called Christians that it jades us about the practice at large – so it’s very nice to see actual Christianity (as I understand it) in practice.